To be sure, the story is being sensationalized by experts and non-experts alike. 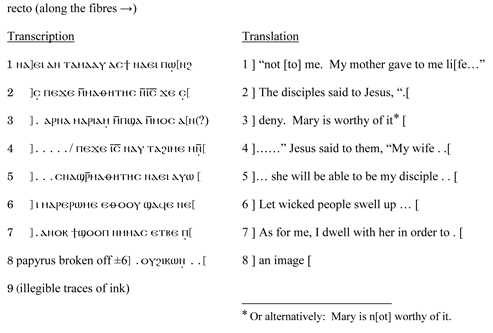 Many see this as proof that Jesus was married to Mary Magdalene. Others have already decried it as a forgery. Time and more tests will bear out the authenticity of the fragment and those of us in the field will wait patiently, while doing the necessary work to answer questions asked of us about the fragment intelligently and with due caution. In an interesting turn of events, though, Al Mohler has provided a rather clear distillation of the desired result of Karen King and Elaine Pagels that publishing this fragment has. 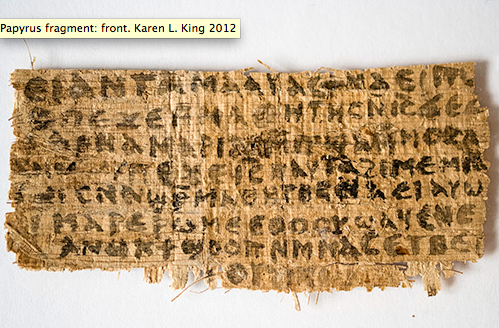 The Gospel of Jesus' Wife? When Sensationalism Masquerades as Scholarship: They argue for the superiority of heterodoxy over orthodoxy. In the Smithsonian article, King’s scholarship is described as “a kind of sustained critique of what she called the ‘master story’ of Christianity: a narrative that casts the canonical texts of the New Testament as a divine revelation that passed through Jesus in ‘an unbroken chain’ to the apostles and their successors — church fathers, ministers, priests and bishops who carried these truths into the present day.” ... King actually argues against the use of terms like “heresy” and even “Gnostic,” claiming that the very use of these terms gives power to the forces of orthodoxy and normative Christianity. Mohler tweeted the link to his article saying that the "real agenda behind" this papyrus is "the rejection of normative Christianity." You know what? I think he's right. As scholars, it is our job to, to the best of our ability, show what the world was really like and this means dispelling the myth that Christianity has always been some pure, singular entity that was never "defiled" by competing ideas and that all of the ideas that did not make the cut to become "Tradition" are in reality "heresy." What the scholar of early Christianity know, and what King and Pagels consistently do a good job of showing, is that since its infancy, Christianity was really Christianities and that numerous ideas were competing for dominance. Yes, those that later come to be understood as "orthodox" call their opponents "heretics," but so too do these groups call the "orthodox" Christians "heretics." These charges flew back and forth between Christian groups in the first few centuries and they've never really stopped. So, though Mohler cannot fathom someone who does not blindly accept the "divine inspiration of the New Testament," the scholar will be patiently working to chip away at the myth of Christianity that so many perpetuate, that it has always and only ever been one single, pure thing. That sounds nice and it makes teaching and preaching in churches and seminaries a lot easier, but it simply isn't true. Mohler has the right to believe that certain early Christian texts were inspired by God and that others weren't, but just stating that there weren't other competing ideas, many of which gained prominence for some time, doesn't make it true. The goal is not to destroy tradition but to open up space for alternative or marginalized voices to be heard within it. A fuller historical portrait of religious piety can enrich the funds of religious tradition, providing more complex theological resources to attend to the complex issues of our own day. One's own faith is not diminished by hearing other voices; it may even be strengthened and enriched (246). The point has never been to simply replace "orthodox" normative Christianity with "heretical" normative Christianity. The point is precisely that all claims to normative Christianity should be rejected.